The American Academy in Berlin is situated in Wannsee. It was established in 1994 in order to promote better understanding between the people of Germany and United States. Scholars and fellows are invited every year to the Hans Arnhold Centre of the American Academy to study, learn and give lectures on various issues that concern both countries. The building of the Academy faces a beautiful lake and, in being away from the hustle and bustle of the city, it provides the necessary peace of mind for intellectual activities. On November 15th, the second-year BA students visited the American Academy for a seminar on Hegel. As part of the core course on Property, we dealt with excerpts from Hegel’s Elements of the Philosophy of Right. Students from ECLA of Bard were invited to attend a seminar led by the Associate Professor of Philosophy at Johns Hopkins University, Dean Moyar. The seminar discussion was based on Dean Moyar’s work on Hegel called Realizing Morality in Hegel’s Unified Account of Practical Rationality. Two professors from ECLA of Bard also participated in the discussion. Various aspects of Hegel’s political philosophy were discussed and clarified. Moyar dealt with issues related to identity, selfhood, marriage and equality in Hegel. Students and faculty members asked various questions and the discussion became even more interesting when somebody brought in Fichte and Kant into the picture. 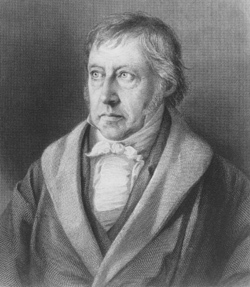 The seminar cleared several important debates that rest within Hegel’s text on property and ownership. Moyar facilitated us with a copy of his article on the idea of freedom in Fichte, Kant and Hegel. The seminar lasted for ninety minutes and was accompanied by hot tea and delicious chocolate cookies.